In no particular order, he ranted about “fake news,” cursed, prompted some in attendance to boo former President Barack Obama, stayed true to his Hillary Clinton obsession, talked politics after saying that he didn't plan to do so, alluded to some sort of cryptic deviant tale about an old friend and broke the Scouts’ rule about participating in political events. It was quite a spectacle to behold! The Boy Scouts of America is wholly non-partisan and does not promote any one position, product, service, political candidate or philosophy. The invitation for the sitting U.S. President to visit the National Jamboree is a long-standing tradition and is in no way an endorsement of any political party or specific policies. Still, many across the country who recoiled in horror of the latest example of Trump lowering the moral bar. That included current and former scouts, leaders and parents, loudly and publicly declared that they did not appreciate the images they saw broadcast from the Jamboree. Someone who made it privately known – after I’d noted on Facebook that this whole mess reflected poorly upon those who would continue to support the organization – was a Philadelphian named Mark Chilutti. 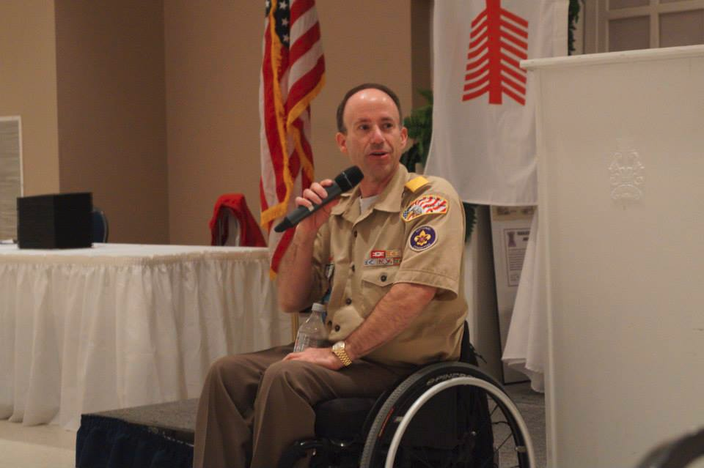 Mark Chilutti joined the Boy Scouts when he was 8 years old. Now 48, he'll speak at the organization's National Jamboree on Wednesday, July 26, 2017. I know Chilutti from my stint at Magee Rehabilitation Hospital, where he works as director of development. He joined the Scouts when he was 8 years old, became an Eagle Scout at 14, served as a national youth leader and remains a local, regional and national volunteer 40 years after he first joined. He’s leaving for West Virginia this afternoon and will deliver a speech at the Jamboree at 10 a.m. Wednesday in Mt. Hope, about 40 miles southeast of Charleston. While he won’t take the same stage that Trump took Monday, he’ll present a speech titled “When ‘Be Prepared’ Takes on New Meaning” as part of the National Eagle Scout Association’s “Very Inspirational Presentation” series. But this year is admittedly a little different what with all the national attention focused on the event. I spoke with Chilutti on Tuesday morning about his reaction to Trump’s speech, his reaction to the negative reaction to Trump’s speech and whether there will be any lasting impact. His message to the Scouts will be markedly different than Trump’s. He’ll talk about how the tenets of scouting – perseverance, problem-solving, etc. – helped him get through being struck by a drunk driver when he was 19, work to purchase a jewelry store at 25 and “dig deep” after he was shot during a robbery at that business three years later. He hearkened back to 1989, when he saw President George H.W. Bush speak before the Jamboree in Bowling Green, Virginia. He noted that presidential remarks at Jamborees are a longstanding tradition at the quadrennial gathering. “Whether Republican or Democrat, it didn’t matter,” he said of Bush’s appearance. “The president was coming to tell a story, that we need more people like you out there in the world, that he respected and appreciated what the Boy Scouts do. That was really cool." I asked Chilutti whether he thought Trump's speech could sully the rest of this year’s Jamboree or leave a lasting stain on the organization itself. He didn't think so. “I think that already, this morning, the kids are back to riding BMX bikes, zip lines, swimming in the pools, going on hikes, performing community service,” he said. “All the Boy Scouts did was invite a sitting president to speak as it has always done.